The U.S. added 138,000 jobs in May as the unemployment rate edged down from 4.4 percent in April to settle at 4.3 percent, according to data released by the Bureau of Labor Statistics. The rate is currently at its lowest level in 16 years, Bloomberg noted. However, the number of jobs gained fell short of economists’ expectations, which predicted the addition of 182,000 jobs. Since January, the number of unemployed has dropped by nearly 780,000, and the unemployment has fallen 0.5 percentage point. Both the labor force participation rate and the employment-population ratio decreased slightly in May. Over the year, the number of discouraged workers declined by 183,000. 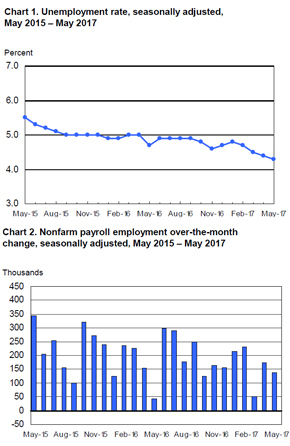 Total nonfarm payroll employment grew by 138,000 during the month. Average hourly earnings for private nonfarm payroll employees increased by 4 cents to reach $26.22. Average hourly earnings for private-sector production and nonsupervisory employees were $22.00, an increase of 3 cents. Sector-wise, professional and business services added the most jobs in May, gaining 38,000 positions. Job gains in this segment have averaged 46,000 per month this year. Food services and drinking places employment increased by 30,000 jobs. Healthcare added 24,000 positions, with 13,000 in ambulatory healthcare services and 7,000 at hospitals. Mining employment increased by 7,000, bringing total job gains in the industry since its October 2016 low to 47,000. There was little employment change in construction, wholesale trade, transportation and warehousing, information and construction. According to Bloomberg, the tightening U.S. labor market is expected to push the Federal Reserve to increase interest rates at their meeting June 13-14.